Feral goat populations started with the abandonment of goat flocks in unprofitable or drought times and through the gradual build-up of escapees from shepherded goat flocks. Over the years feral herds have developed and multiplied in areas which have offered some natural defense against predators. These goats have effectively adjusted to the environment to the degree that there is no longer any strong resemblance to the original breeds. Research indicates that these animals possess strong fiber and milk producing qualities. When domesticated and carefully selected, they provide an excellent base for the development of cashmere, mohair, leather and meat production programs. This domesticated animal is now being referred to as the Australian goat. An increasing number of producers are running them in conjunction with sheep, as a means of controlling weed and scrub growth. These enterprises can now provide significant numbers of goats that are even in age, size and weight. Does from these flocks are suitable for breeding Cashmeres, cross-breeding with Angoras for fiber production and as recipients in fertilized ovum transplant programs. 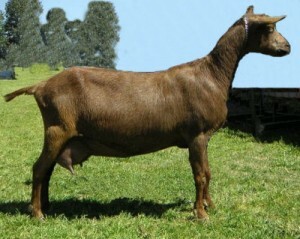 Entrepreneurs are also utilizing the Australian goat for the overseas export of meat and skin.